Army CPT Blake Russell died July 22, 2006, of injuries sustained while investigating a possible mortar cache during combat operations in Baghdad, Iraq. 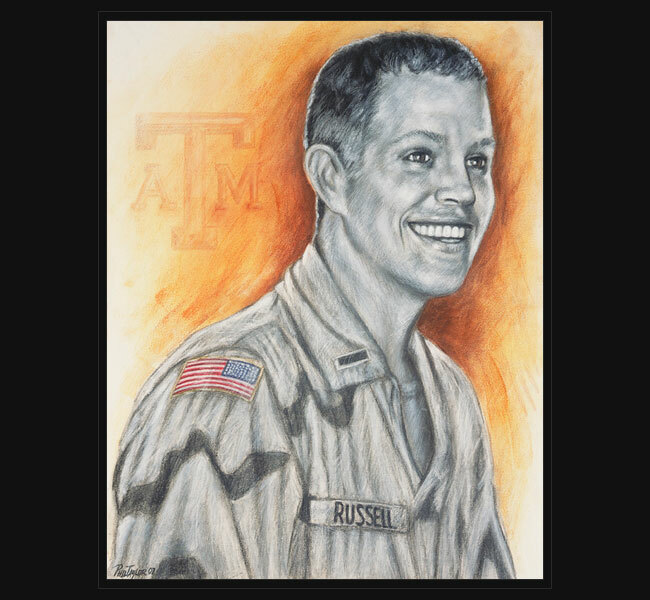 Blake Russell’s portrait was the inspiration for Phil Taylor to begin The American Fallen Soldiers Project. Because of the healing the portrait brought the family, Phil Taylor knew he wanted to continue in his effort to comfort as many families as he could through his art. “When Blake was alive, he received great pleasure jumping from the car at a stoplight to give a dollar to a less fortunate person on the street. Can you even begin to grasp how elated he is to still be giving to those “in need” … families who need to know that the memory of their loved one will live on forever? Through Phil’s amazing talent we all have received that assurance”. “I am certain Blake is standing next to that box as it is opened … with a tear in his eye, a huge smile on his face, and a heart filled with gratitude for the friend who made it all possible”. Original portrait was given to Blake’s father, Ron, in August 2007. Blake was a childhood friend of Phil Taylor’s and this portrait was the inspiration to begin The American Fallen Soldiers Project.